Six thousand people attended a multicultural Indian festival in October, supported by the Adelaide Football Club. The Deepavali (Diwali) festival, which is also known as the Indian festival of lights, is an annual festival celebrating the spiritual triumph of light over darkness, good over evil, and knowledge over ignorance. 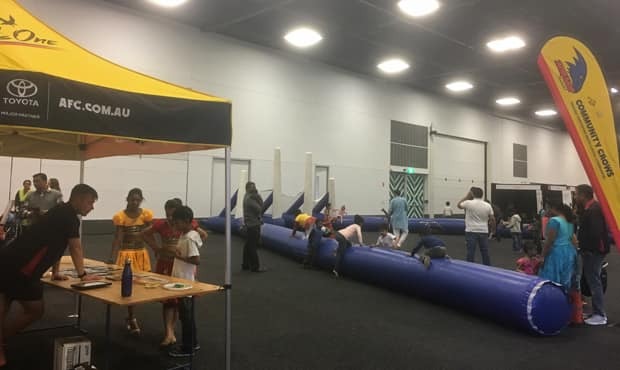 The 2018 South Australian festival took place on Saturday, October 20, in the Goyder Pavilion at the Adelaide Showgrounds. The Club set up a marquee and the inflatable goals, as well as a handballing target and a bag of footballs. The kids in attendance had great fun at the activations, as did their parents, most of whom had never heard of the Crows before. Adelaide’s Multicultural Liason Officer Cecile Saidi said the Club’s involvement in multicultural events and festivals is important. “Our involvement not only promotes our brand and the sport to the multicultural communities, but also gives us the chance to learn about the different cultures by engaging directly with the different multicultural communities,” Saidi said. “This way, we can relate to each other on a human level, and enjoy a better relationship.